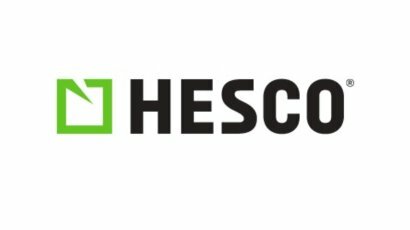 Established in 1989, Hesco are the original developers of the Earth Filled Barrier technology. It started when Jimi Heselden, who originally was a coal miner, needed to protect his family home that was being destroyed by the storms of the North Yorkshire coast. He developed a wire mesh cage system that constructed a wall that saved the property. Since this the Concertainer units have been deployed across the world, protecting homes and savings lives in the event of a conflict or natural disaster. The famous Camp Bastion is named after the company as the products are used to defend and secure their jets and helicopters. Sliding Gates are common in Commercial and Industrial sectors as they do not take up space like other gates do; they are also used to protect vehicles and stock as they are the most secure Gate system. When a Sliding Gate is closed, they are held in place by a tracking system and motor, making it almost impossible to open. 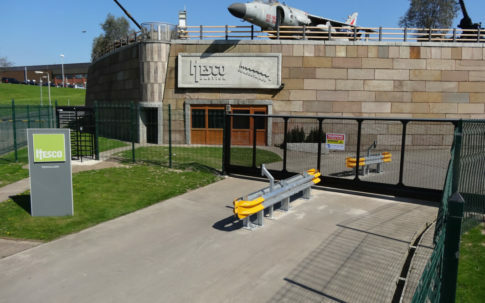 Because Hesco Bastion provide defence, environmental and protective barriers to the Military and the Ministry of Defence, they have a great reputation and so they have a need for a high level of site security themselves. Hesco wanted to ensure their premises, products, guests and personnel were protected against any potential breaches or unwanted visitors. 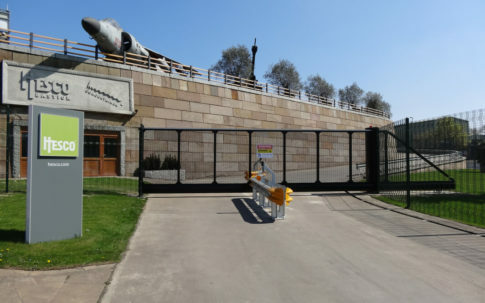 To ensure all health and safety factors were met they wanted to have control over Vehicular and Pedestrian access, which included securing the perimeter whilst allowing access to those authorised. 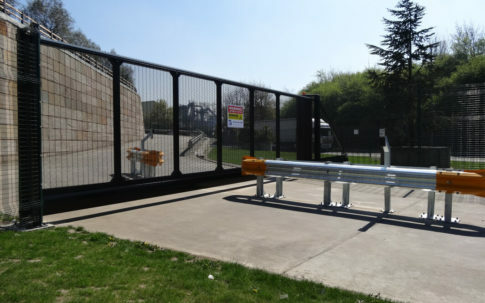 After listening to Hesco’s needs we knew we could solve Vehicular Access by installing a heavy duty Automatic Cantilever Sliding Gate with Anti-Climb Spikes; to control the Pedestrian Access we suggested a Turnstile and 358 prison mesh fencing around the site ensuring that any visitors had to go through the Turnstile or Automatic Gate. Hesco went ahead with our suggestions, along with our suggested works of creating inbound and outbound lanes and installation of Access Control on Armco Traffic Islands. Cross Green is an industrial area of Leeds, West Yorkshire. It is 1 mile away from Leeds City Centre, with the A63 running through the middle, splitting it from the residential housing estate. North of the area was known for the main Leeds Wholesale market, which has recently been redeveloped into a facility for converting household waste into energy (Leeds Recycling and Energy Recovery Facility). Stourton, Wykebeck, Halton, Osmondthorpe, Sheepscar, Holbeck, Hunslet, Beeston, Belle Isle? Interested in an Automatic Sliding Gate in Cross Green? Want to have control over who you let onto your premises? Please do not hesitate to contact us on 0113 281 2106 and we will discuss your options.